I talk to my Mom almost every day now since she lives over 700 miles away. She gets calls from other family members and her neighbor calls her every morning to check on her also. I'm certain that every phone call cheers her up and helps brighten her day which is spent in her small home with her dog usually watching TV. My mom (Rose Lark Schulz) is the youngest and last remaining survivor of Newton and Irene Lark's family. She was born in Sonoma County, California in 1917 and raised from a small child by her father with the assistance of a Nanny. Her father known by my generation as "Papa" Lark was a Pharmacist and became owner of the Lark's Drugstore in Guerneville, Ca in 1910. Rose and her sister Marion and two brothers, Warne and Don grew up in Guerneville when the Railroad was the main transportation to this resort town from the Bay Area. In the summers the town was choked with summer vacationers who filled the local beaches and swam in the warm waters of the Russian River. My mother married my Dad at the early age of 17 and I was born the following year. After I was born she was told by her doctor that she would be unable to give birth again. She loved children and fortunately had many nieces and nephews(my beloved cousins)who were her surrogate children in a sense. Auntie Rose has been a very loving, warm,affectionate and giving person in their lives as well as mine throughout the years. I owe my ability to be a loving, giving person as well as my love of music, dancing, good food and cooking to my mother. She was "Rosie the Riviter" during WWII working in the Richmond shipyards,helping to build ships that would carry supplies to our military personel overseas. My Dad was her crew boss and as the story goes he had to fire her eventually. It was not that she wasn't a good worker but because the other men on his crew were having trouble concentrating on their jobs. In other words, my mother was distracting them because she was attractive. In fact when I was old enough to realize it I became protective of her when men whistled. She thought it was funny when I told them that she was my mother. After the war we moved to Cazadero because my Dad accepted a job working for my Uncle Warne Lark who had invested in a small Lumber Mill. Not many women would have or could have endured the lifestyle of living in a tent for months and cooking outdoors with no running water or shower facilities. However,my Mom was a trooper and she did it with a flair, cooking gourmet meals with food gathered by my Dad from the wild. We ate well and lots of Venison, Salmon, Steelhead, Trout, Abalone and Wild Mushrooms that year. In the winter of that same year we moved to a small 3 room house(shack)on the Bohan Ranch up the hill. We lived without electricity and had only a Outhouse for a toilet. For bathing we heated water on a woodstove and poured it into a tub large enough for one person. It was during that year I read Tom Sawyer and Huckleberry Finn by candle light and dreamed of the day I would become a Boy Scout. The following year we moved to Guerneville where My Dad and Mom built a small home on the Russian River. Today I have wonderful memories living on the river,fishing,Scouting,Baseball,and swimming in the river. Summers spent with Herb Genelly a life long friend, and his family who owned and operated Genelly's vacation beach resort. Herbs father Herb and mother Edna had weekly BBQ's of steak and delicious Tamalie pie and a Horse shoe pit where many a game was played by Herb and I. Life in Guerneville was interupted by my parents divorce and I moved to San Francisco reluctantly in 1952 with my Mom. I finished my last two years of School at George Washington High school. At the time of the relocation I was not happy having to leave behind my friends and it caused some bitterness and tears. In retrospect the experience was key in the growth of my character as I was exposed to a greater diversity of ethnic and religious backgrounds among my peers. In the summers I worked for my Uncle Warne in Lark's Drugstore in Guerneville and the memories of those 5 years will linger forever in my mind. In the 60's my Mom took over my job as Manager of the Golden Gate Riding Academy after I left because of a divorce with my first wife. It was there that she became a "legend" among her friends at the stables for her outgoing, friendly as well as "take no guff" personality and delicious cooking. Her Parties for the stable crew and mounted Policeman were truly memorable to say the least. Her experience at the stables taught her how to delegate responsibilities and she has used that talent to her advantage over the years with those of us who are willing to help her when asked (or coerced) with food. My cousin Ray Lark can attest to that as he has helped her more than anyone including her own son on projects ranging from plumbing, gardening,Washing machine repair, painting, and home maintenance, etc. former professional boxer and Bar owner. They traveled in their RV to Thousand Trails resorts often accompainied by her sister Marion and Ed LaFranchi. 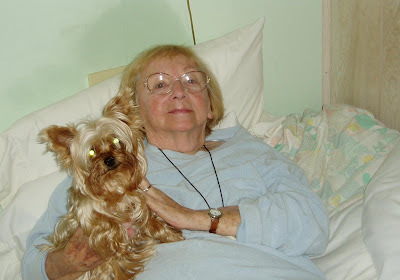 When "Jimmy" could no longer care for himself my mom became a fulltime dedicated caregiver for nearly 10 years. Mom started a tradition in the family years earlier for her Thanksgiving gatherings at her home on the river. A place where each of us felt special and welcome and a place where we knew we would be loved,hugged and well fed with her Turkey dinner and special Pumpkin Chiffon pie and cakes that are "to die for". We have seen her at her best and at her very 'BEST' with her "hackles" up and have learned that she minces no words nor hides no emotion and you can "forget about it" when it comes to political correctness. If anyone got out of line at Rosies they were put in their place with the diplomacy and swiftness of an Army drill sargent. Anyone who knows her will tell you that she speaks her mind and you definitely know where she's coming from. I'll never forget calling my mom to tell her that I wanted her to meet my "new" love. Her initial response was "Oh no not again, after what you have been through with women?" I finally convinced her that Kimberley was the one girl in my life who is a real friend and this would be forever. Before the call ended I mentioned that Kimberley was kind of self conscious about the size of her feet. I asked my mom not to say anything or stare at her feet. She responded "Oh I wouldn't do that". The day we arrived at my Mom's house and walked into her living room the first thing my Mom did was look closely at Kimberley's feet and say "You're feet aren't so big honey"! That is the definition of embarrased. A true character she is and always will be. She has weathered and survived many health problems along the trail of life and still going at the age of 90. Her wealth cannot be measured in her bank account or by material things. It is measured in her toughness of character, spirit for life,loving personality and a beauty that comes from within. one day I was driving a friend home in Martinez, CA. I went by a fellows house that was pretty much covered with neon signs. Lo and behold there was one from my youth....Jimmy Britt's Bar neon sign with Jimmy's profile and the moving boxing gloves! I had to turn around, go back, and stare at it for awhile! Thanks Russell I have wondered where that neon sign ended up. I have passed this information on to Jimmy's only son Jim Britt Jr. Funny thing happened today. Into my memory banks popped "Jimmy Britt's Inn" and the small part of my life spent in Guerneville. I have no idea where it came from - but there it was and here I am google-ing Jimmy Britt's Inn - thus, finding your blog. My parents moved my sister and myself to Guerneville after my father had a car accident and was partially crippled. He had been a saloon owner in SF, owning a bar called The Port Hole. TPH opened in 1948, the year of my birth, and closed in 1952, when my dad had his accident after driving while intoxicated. Shortly thereafter, we moved to our summer house in Russian River. I well remember playing in the waters there and being such a happy kid. Many many times we went to the Jimmy Britt's Inn. I have photos of my sister and I sitting in the buckboard wagon out front. I have pictures of Jimmy and his wife - tho I cannot remember her name. I would have been 4-5 at the time. By the time I turned 6, we had moved to Las Vegas for my parents to try their luck there. I had not thought about these things in many years. Good memories of life in Guerneville and playing with a neighbor named Perry White. I have just realized, your original post was 5 years ago!!!! I must be getting slow on the draw. Did not catch that one. Hello Ter'e Thanks for your comments about living in Guerneville and Jim Britt. Jims wife's name was Sally.